AROMA: Smoked salmon, smoked salami, liquid smoke. A touch of clove and spice, but mostly, you know, smoke. TASTE: Burst of smoked meat up front, followed by clean, wheat flavor and minimal finish. Smoke flavor becomes more pronounced as beer warms up. 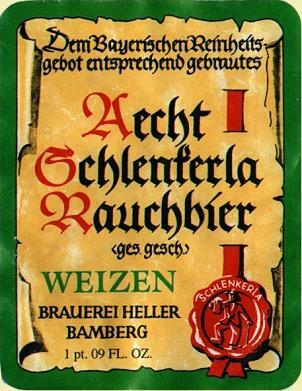 Posted in Tasting Notes.Tagged Aecht Schlenkerla Rauchbier Weizen, Eulogy, Philadelphia, Rauchbier. I’ll be honest — I was excited to try this one out. Bacon flavored beer? How could it go wrong? Sadly, this one goes the way of nuts and gum — two great things that are better enjoyed separately. I’ll echo Barley here, and say that the smoke flavor overwhelms the palate, making this particular rauchbeer more of a curiosity than anything else. It was the first of this style that I’ve tried, I hope others are more balanced. I think the problem is that it’s a fairly light weizen. The brew just can’t hold up to the smoke. I much prefer smoked porters and stouts…beers robust enough to take on the bacon and live to tell about it. I’m encouraged enough to try another. It wasn’t that the flavor was terrible, just the balance. As you said, overwhelming smoke. It makes sense to me that porters and stouts would fit the style better. The same brewery does a Marzen that’s serviceable – A little more subdued and less bacony. For a real treat grab the Smoked Porter from Alaska Brewing Company. Generally smoked porters/stouts just taste peaty, but this one has some of that liquid smoke characteristic that you’ll find in a true German Rauchbier. Smoked porter it is. I’ll see if I can find it at the local liquor store.